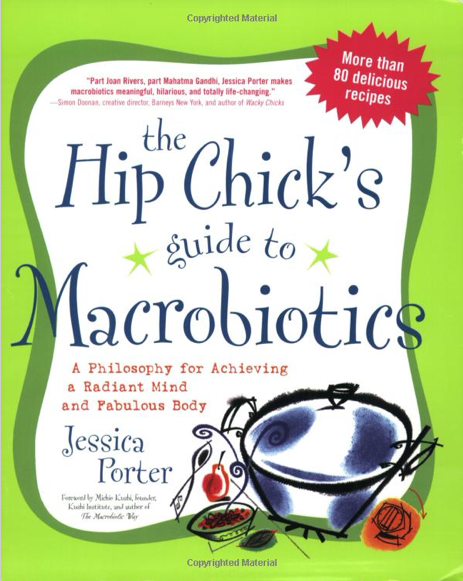 The Hip Chick’s Guide to Macrobiotics takes Macrobiotics and the many misconceptions about it out into the light of day and shows why it is “hip” and “smart” to follow the philosophy of George Ohsawa, the founder of the modern macrobiotic movement. I’ve been macrobiotic for many years, and have read most of the macrobiotic philosophy and cook books available. But Jessica Porter adds a comedic flair to her writing that made me want to read one more. For those new to macrobiotics, Porter makes the philosophy of achieving balance accessible and easy to understand. How do you find this balance? In macrobiotics, it’s through your diet and through the balance of yin and yang in your life. What are yin and yang? The opposing forces always at work (feminine vs. masculine, wet vs. dry, expansive vs. contractive, light vs. dark). While Porter entertains us with her foray into macrobiotic cooking and the mishaps along the way, she also provides a deeper look into Ohsawa’s “order of the universe,” his philosophical basis of macrobiotics. Whether you want to improve your health, reach your optimal weight, or look closer into the meaning of life, Jessica Porter gives you food for thought explaining “A Philosophy for achieving a Radiant Mind and a Fabulous Body.” I have benefited greatly in my own health from the macrobiotic diet, as it is a cleansing diet (helped my body rid itself of an ovarian cyst), as I reveal in my upcoming memoir, Chakra Secrets. I have also seen many people recover from cancer by following a prescribed macrobiotic diet. But this book is more about applying macrobiotics to every area of your health to find mental, emotional and spiritual balance.